The Angriest: Star Trek: The Next Generation: "Gambit, Part 1"
It is 11 October 1993, and time for another episode of Star Trek: The Next Generation. The apparent death of Captain Picard (Patrick Stewart) leads the USS Enterprise on a hunt for a rogue starship of pirates, who are moving from planet to planet stealing archaeological artefacts. When Commander Riker (Jonathan Frakes) is taken prisoner by those pirates, he finds Picard alive and well and working in their crew. "Gambit" sees Star Trek: The Next Generation really head where no Star Trek episode had gone before: into a full-blown space opera replete with starship chases, space battles, races to track down ancient artefacts and a shipful of space pirates. It is hardly The Next Generation at its most intellectual, but after the past three episodes - whose quality has ranged from the underwhelming to the dire - it is a refreshing change and a hell of a lot of fun. Admittedly the first few scenes are something of a slog, as Riker struggles to come to terms with Picard's death before heading off for revenge. Obviously at no point is the viewer ever in doubt as to Picard's safety - The Next Generation isn't going to kill its lead actor off-screen four episodes into a season - and that makes almost the entire first act a somewhat redundant exercise. It is only once Riker's away team encounters the pirates and Riker himself gets captured that the episode kicks into gear. The space pirate scenes are dominated by Richard Lynch, of Sword and the Sorcerer and Battlestar Galactica fame, play Arctus Baran. He is a wonderfully entertaining villain, combining a sneering charm with an over-the-top cruelty. His entire crew - including Picard and Riker - are fitted with devices that enable him to cause excruciating pain at the press of a button. A broad adventure narrative like this works best with a strong villain, and Lynch fits the bill perfectly. Robin Curtis is also notable as Baran's Romulan lieutenant Vallera. Curtis had previously played Lt Saavik in Star Trek III: The Search for Spock, and gives a very Vulcan-like performance as the Romulan pirate - for reasons made clearer in Part II. Patrick Stewart and Jonathan Frakes look like they're having a ball, as Picard and Riker work together to manipulate the pirates into letting both of them live. Back on the Enterprise Data (Brent Spiner) assumes command - the second replacement captain in the space of 30 minutes - and does an immediately authoritative job. 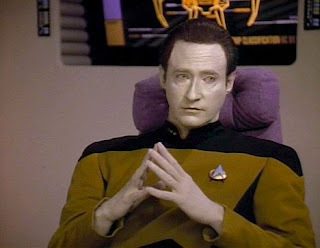 It's a shame we never got to see Data commanding a starship full-time; he's immensely watchable in a command role with a very distinctive change in demeanour while sitting in the captain's chair. It all ends in a fairly cheap cliffhanger, with the pirate ship firing on the Enterprise, but that doesn't really matter: this is just breezy sci-fi adventure. It's a refreshing change, and a nice change of pace. Season 7 finally gets a properly enjoyable episode, lifting the quality ratio up to 25 per cent.